In a demonstration of increasingly close security cooperation between Canberra and Hanoi, Australian instructors in Vietnam are helping the Vietnamese prepare for the deployment, including coaching the members of a field hospital to bring their English up to the standard required by the United Nations for large-scale medical operations. The 70 hospital staff include doctors, nurses and support personnel. Australia is also helping Vietnamese officials work their way through the UN’s bureaucratic processes. In recent years, the relationship between the two nations’ defence forces has become steadily closer. 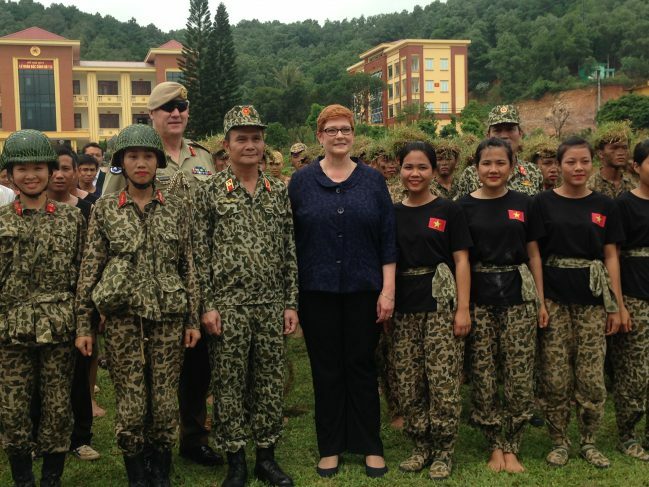 Over the past week, Senator Payne visited Singapore, Thailand, Laos and Vietnam for talks on regional security issues. She was accompanied by the ADF’s special forces commander, Major General Adam Findlay, who met his counterparts in each country to discuss escalating regional security threats and ways to improve cooperation in dealing with them. In Vietnam, local special forces put on an extraordinary display of counterterrorist and hostage-rescue techniques for the Australian delegation. Teams of male and female soldiers emerged from the landscape in a display of camouflage skills and then scaled the walls of buildings and blasted targets with sniper fire. Keen to play a greater role on the world stage, Vietnam approached Australia some time ago saying it was looking for a UN non-combat mission to showcase its capabilities. It sought Australian help in planning the mission. The RAAF is likely to use some of its giant C-17 transport planes to carry the Vietnamese to South Sudan. That will happen once the contingent reaches the required level of English language competence. Senator Payne said that over decades of diplomatic engagement, Australia had sent strong messages of support to Vietnam ‘that we are prepared to be very consistent in our involvement, that we are not capricious in any way, we just get on and do business’. The English-language training that Australia has provided to Vietnamese defence personnel and officials over many years stood Australia in very good stead. Her interpreter on this trip was Australian-trained. Australia will provide the Vietnamese with around $400,000 worth of specialised equipment, including a large deployable shelter which will serve as accommodation, an ambulance and a power generator. The United States has agreed to provide the Vietnamese military with two buildings to house field hospitals, one in Vietnam, which will be used for training, and the other in South Sudan. The Vietnamese will replace a British medical contingent there and hope to later send a 268-strong engineering team. As its military personnel gain international peacekeeping experience, Vietnam hopes to also dispatch police and civilian specialists on UN operations. An Australian official said the ADF understood the difficulties involved in deploying whole units overseas, ‘but we do it all the time’. With its considerable expeditionary experience, the ADF will give the Vietnamese ongoing logistical advice over the coming year. Vietnamese officers have been invited to attend a military training exercise in Australia which will include deployment of a field hospital. The Vietnamese aim to deploy to South Sudan within 12 months.